You know Kitty Angels as a cat shelter, but over the years, we and our volunteers have been asked to help rescue and adopt out other animals, including dogs, rabbits, a turtle, and even a sheep! 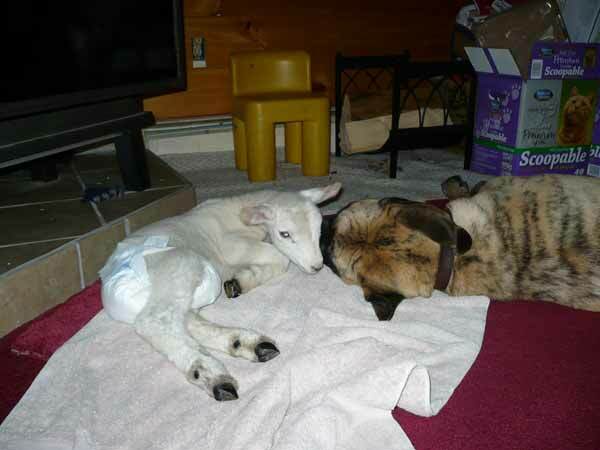 This is the story of Mazzarie (aka Maizy Mae), the Kitty Angels Sheep. Maizy's story is started by long-time Kitty Angels volunteer, Caroline "Grec" Greco. "Well I got a call from a local farmer last March. He had a lamb in trouble - she couldn't walk and was heading for the stew pot. This was my second lamb from this local farmer. 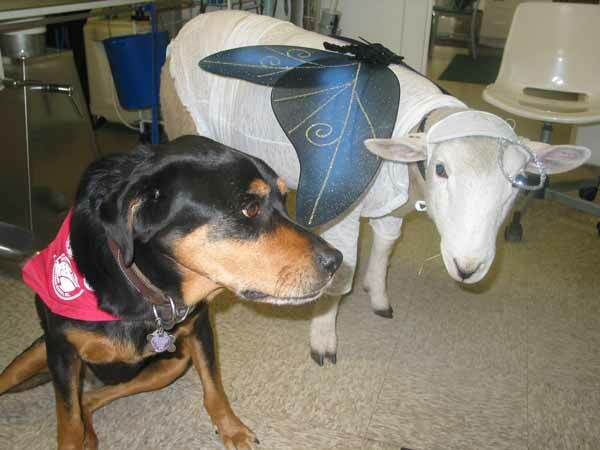 I called Jackie at the Dunstable Animal Clinic and asked her if she wanted to adopt a lamb in need. Jackie, with her huge heart, said YES! Jackie and the vet, Dr. Tara, rehabbed Maizy's bad leg and found that she had gotten an infection in her leg joint and was unable to straighten it or put weight on it. It was thought that the infection stemmed from her tail being docked and it had gotten infected. "Not knowing exactly what to do, Maizy had a few rounds of antibiotics that seemed to help some with the infection but not with Maizy being able to straighten out her leg fully. Amputation was going to be the last resort! So her leg was fused straight in a cast. Jackie and the folks at DAC nursed Maizy and changed her dressing/ bandages and cast as she grew. Sometimes weekly she grew so fast! And her diaper many times daily : )"
Jackie picks up the story. "Mazzarie is a one in a million kind of sheep and I never thought I would get so attached to a sheep. She ended up on three different antibiotics and banamine (anti-inflammatory/pain relief). Everyone that has ever dealt with Joint ill (the infection) told us, "give up they always die," but Mazzy had a strong will to survive and we were willing to do everything in our power to help her. Her leg fused at the elbow and she was unable to straighten or bear weight on her leg. Since no one had ever had one of these afflicted lambs live, no one knew how to fix her leg without amputation and a wheelchair due to how much she was going to weigh. "We decided to try straightening the leg and fuse it pointing down so she would be able to use it like a crutch. Mazzy had her leg straightened and cast changed on a daily basis because I was doing water physical therapy at night with her. She grew very fast, averaging two pounds weight gain a day, and she grew stronger every day. She had her diaper changed and was bottle fed multiple times a day and required many baths. The straightening took well and she was a good sport about having all this work done to her. She very rarely complained, considering the pain she had. "My dogs Jeada (the Rottie) and Madden (English Mastiff) took her as part of their family and kept a close eye on her and helped keep her spirit up. They always made sure she had cuddle time with them and kept her warm and clean. Being raised by the dogs and encountering many dogs at the clinic has made her believe she is a dog. She still loves riding in the car because it means she gets to go somewhere and be the center of attention. She goes for walks with me, my son and the dogs, and loves meeting new people, especially kids. Because she has such a good personality and has been exposed to so much, nothing scares her. "My son Matthew and I have decided to get her certified as a therapy animal and allow other people to enjoy her as much as we do. She will be going to nursing homes as well as hospitals where she will be visiting sick children.She also helps us promote agriculture and show people that sheep are very intelligent creatures, contrary to popular belief. I am hoping from this experience people will see that sheep are not disposable and have the same value as dogs and cats, and that we may be able to help other lambs that are affected by this condition. Mazzy loves to run and play now and has the life most sheep only dream about. She is a bit of a princess; she loves getting dressed up and being the center of attention. Everyone in Mazzaries life and Mazzy herself is very grateful to Grec for saving her life." 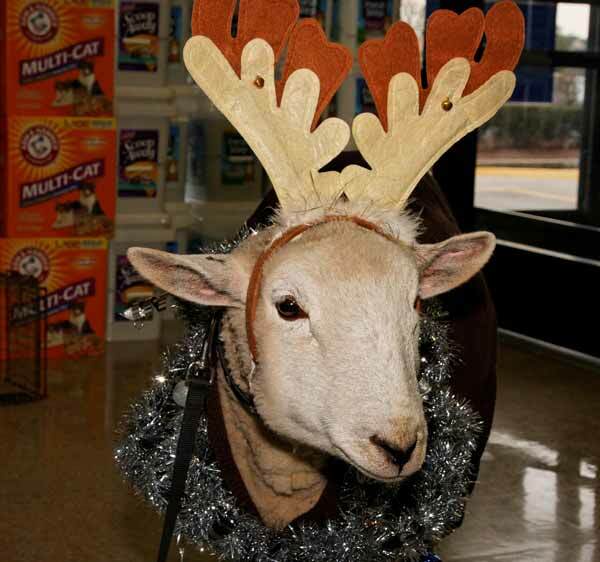 The picture at the top of the page was taken at PetSmart in Nashua. Mazzy checked out the dogs that walked in and enjoyed the attention from the little kids who were enthralled with her. 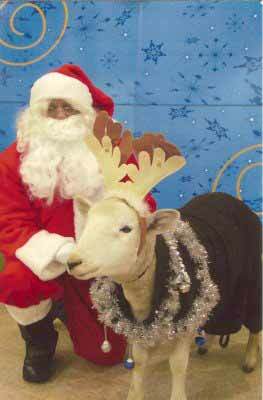 One little girl looked at Mazzy, turned to her dad, and said, "Look, there's a reindeer!" Her father looked at her and nodded, "Yes, there is".